Hello and happy Tuesday. It's time for another challenge at CASology. 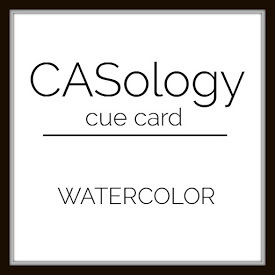 This week, our cue word is Watercolor. This was a really quick card to create. I started with a water coloring page from PTI featuring Bold Blossoms stamps. I used my Zig water color pens to water color the flowers and leaves. I like how forgiving water coloring is--it doesn't take much to get something that looks kind of artsy. Now, it's your turn. How does WATERCOLOR inspire you? I hope you play along this week. Please remember to keep it Clean and Simple. Beautiful watercoloring, Joyce! I love how you created so much variation in the leaves...so pretty! This is so pretty!! Love the flowers you chose and the colors. Lovely card. Beautiful purple flowers! Again the black sentiment and accents in the flower center are striking! This image begs to be watercolored and you did a beautiful job with it. I am so wanting to break out my zigs. I had a knee replacement 3 weeks ago, and I have lots and lots of time on my hands. The sad thing is that I can't sit comfortable in a position that is conducive to crafting :((( Hoping that situation is remedied soon. Those pages look like such a great solution when you need a quick card. Your colors look gorgeous! Hey Joyce!! I love that big flower. I love how you put it up in the corner, great design. Your watercoloring is great too. Joyce what a beautiful watercoloured blooms and so beautifully masked too! I have been loving using my ZIG's these days. So beautiful and dainty, love your sweet flowers.